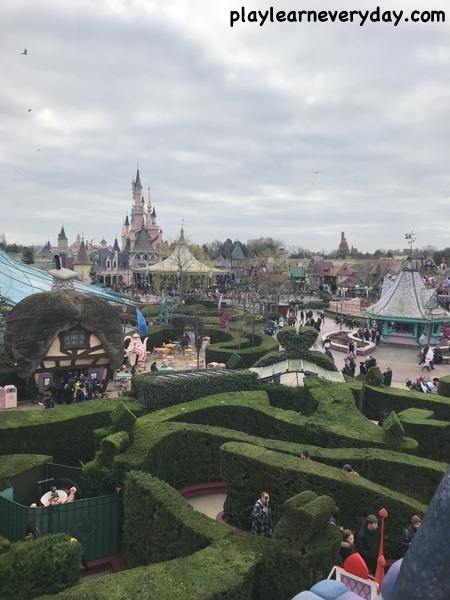 We just got back from our very first trip to Disneyland Paris and we absolutely loved it! We surprised the children by telling them about the trip on Christmas morning, then left a few days later. 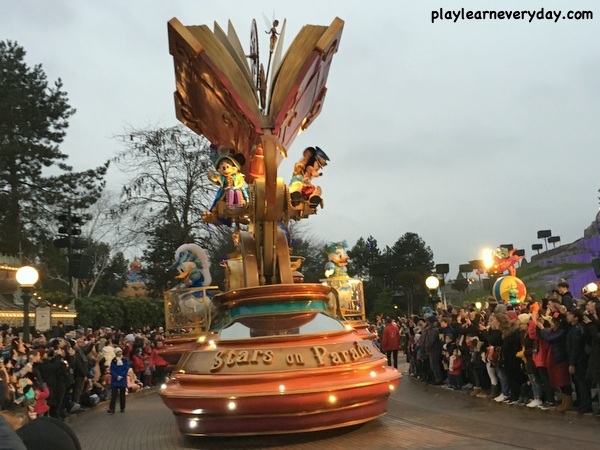 You can read more about Preparing for our Trip to Disneyland Paris here, to get an idea of our plans. 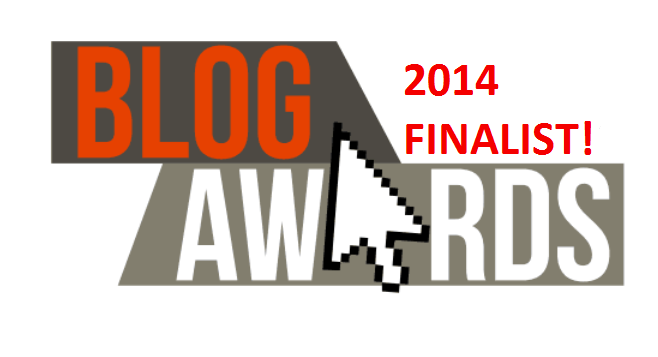 The day finally arrived and we were off the charts excited! We loaded up the car with all of our suitcases and drove down to Folkestone to get onto the Eurotunnel. Checking in couldn't have been easier, and as we were early we actually got onto an earlier crossing, which was great. Basically we just drove our car straight into a train compartment, there were staff there to guide us, we parked the car and that was it. We sat for about 35 minutes whilst the train drove under the Channel and then came out the other side in France! 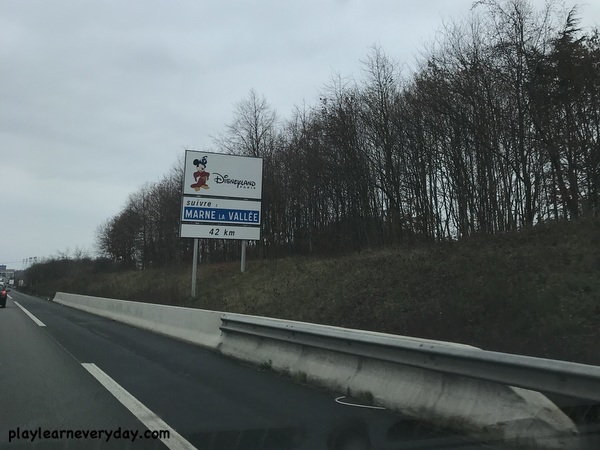 The drive on the other side is slightly longer, but we had lots of fun Disney themed car presents for the children to keep them occupied (which you can read more about in our Planning for Disneyland post) and lots of snacks. So we were actually able to drive straight through without any stops, which of course got us to Disneyland even earlier than we had hoped! 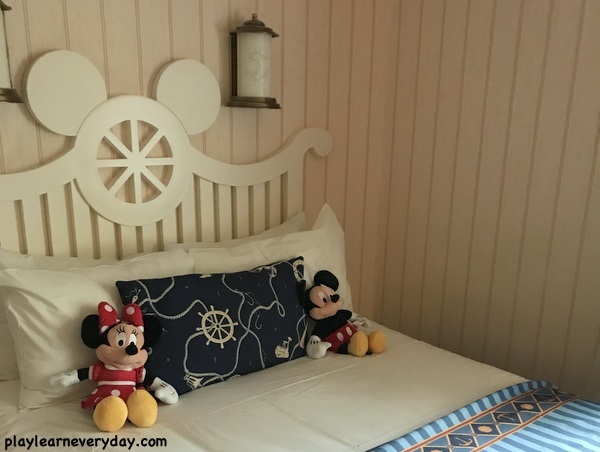 We arrived at Disneyland and followed the signs for the hotels, we stayed at Disney's Newport Bay Club. We joined a short queue to check in to the hotel, and spoke to a lovely lady who gave us each some special Disneyland badges, some Christmas chocolates, our Magic Passes, lots information about parks (including maps, schedules, details about extra magic time, and hotel information about breakfast and the swimming pool). We each had our own Magic Pass which worked as our room key, our park tickets and held our meal plan vouchers as well. 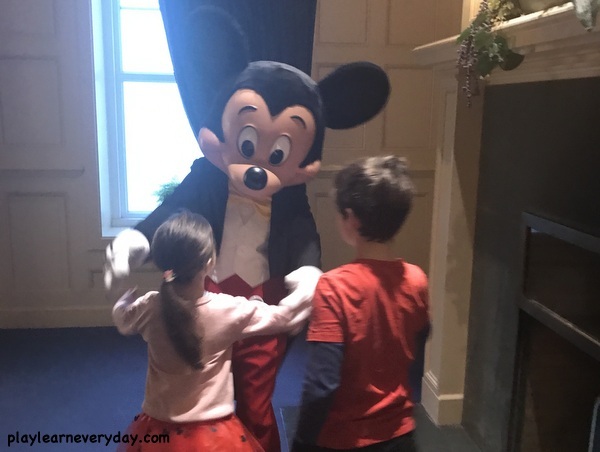 We went up to our hotel room and we loved it straight away, the children had so much fun with all of the themed areas and finding the characters on the wallpaper. Of course even the products in the bath were Mickey themed and had little mouse ears on! 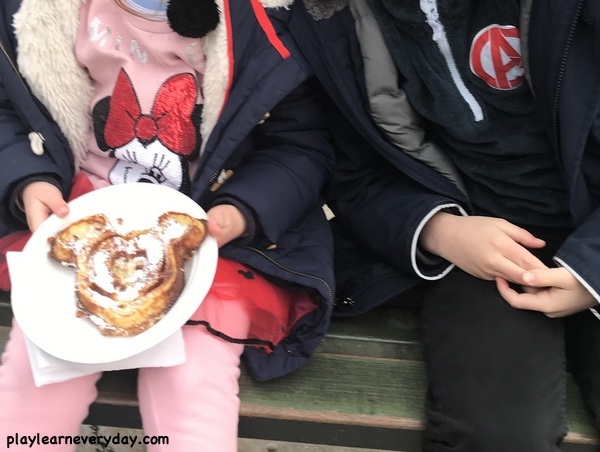 We quickly settled into the room, then bundled up warm to take our first walk around the lake and through the Disney Village. It is a lovely area, and even though the hotel does provide a shuttle bus to the parks we never used it. It isn't a long walk and we enjoyed getting to see all of the shops and restaurants in the village as well. 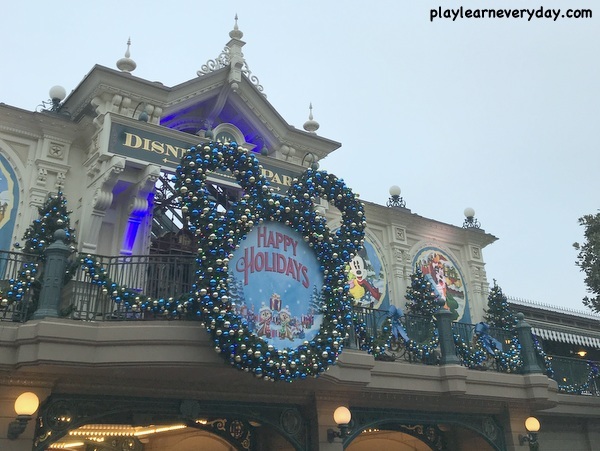 We went straight to Disneyland Park and just wandered around to soak it all in. 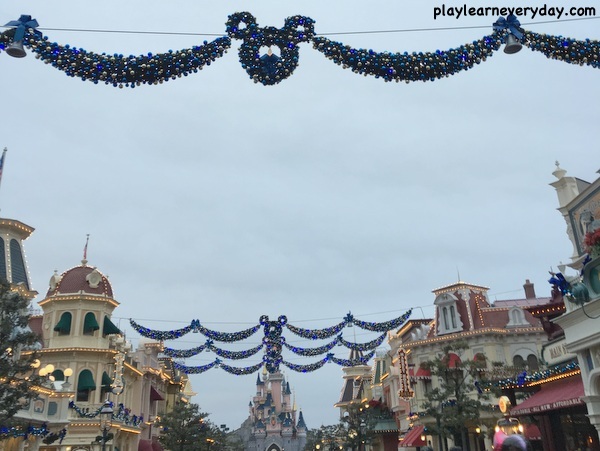 The children were so excited to see the castle for the first time, to walk down Main Street USA and to see all of the lovely Christmas decorations. 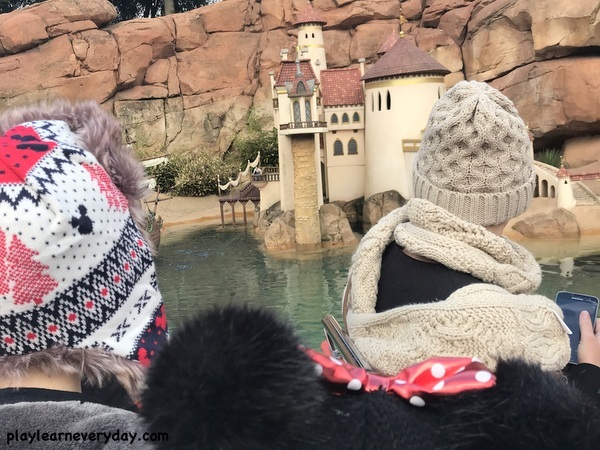 As I have a very big Princess fan we also walked around to check out the 'secret spot' and some of the other possible Princess spotting locations. (The 'secret spot' is through the castle and to the right. 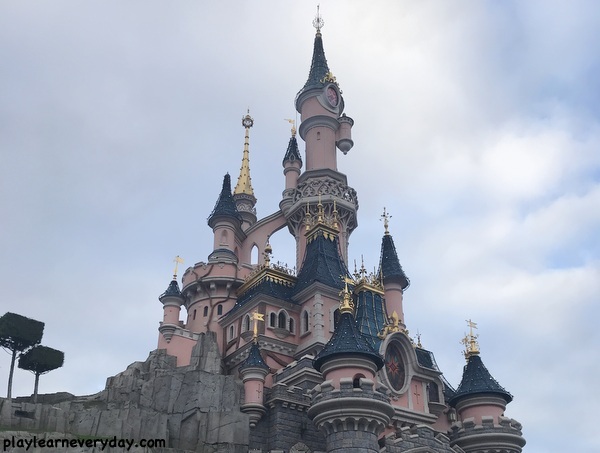 It is near Auberge de Cendrillion - where you can book to have a princess lunch, if you go into the courtyard you will see Cinderella's carriage, which is also a great photo spot, to the right of that there is a gated fence. 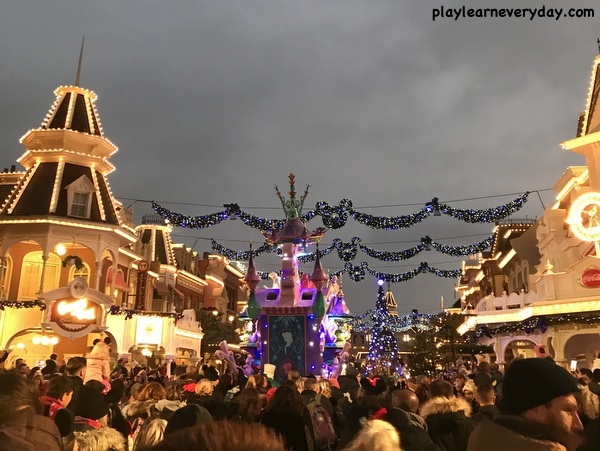 If you wait there before any of the stage shows or parades it is possible that you may see some of the characters or Princesses walk past. They won't stop for autographs or photos, but you can wave and say hello. We were also told that you can sometimes meet Princess Jasmine with the Aladdin characters in Adventureland and you can sometimes meet Merida in Frontierland. Unfortunately we didn't manage to see any extra Princesses in these spots, but it is worth checking! We then found a good spot to wait for the parade to start. Such a great way to begin our Disney adventure by watching Stars on Parade! We didn't get there early to find the perfect spot in the perfect location, but we managed to get to the parade route about 15 minutes before it began and found a lovely spot with a great view. To be honest the children couldn't have waited much longer than that, so we were happy. Ivy was sitting down on the ground watching the parade and waving to all of the characters. 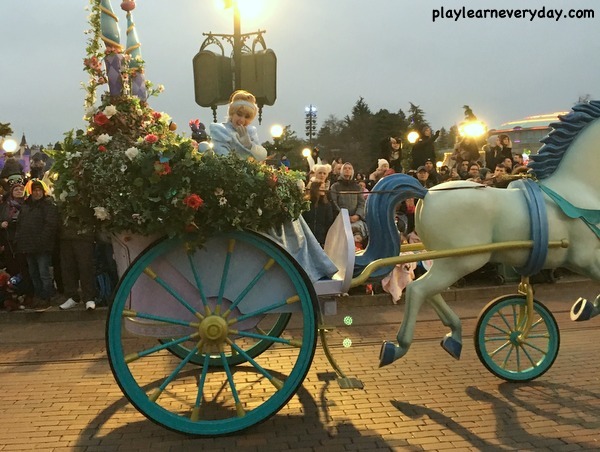 She was so excited any time that a Princess passed by, especially when she had a special wave from Cinderella! When the parade was finished it seemed that loads of people joined in and walked behind parade all the way down Main Street USA, so we joined in as we were heading out anyways. 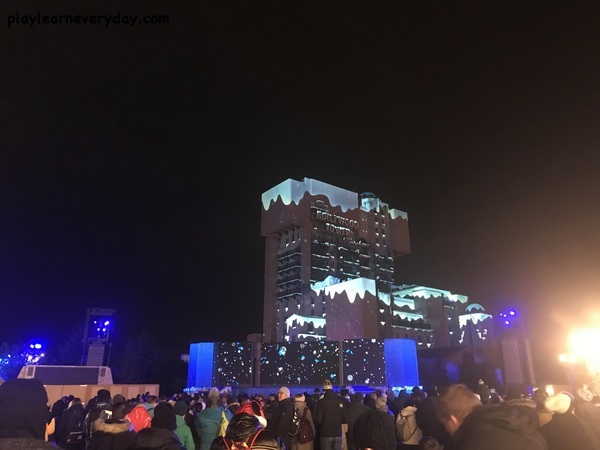 It was so magical following the Frozen float out, hearing Let it Go play as the artificial Disney snow fell all around us. We were feeling the Disney magic already. 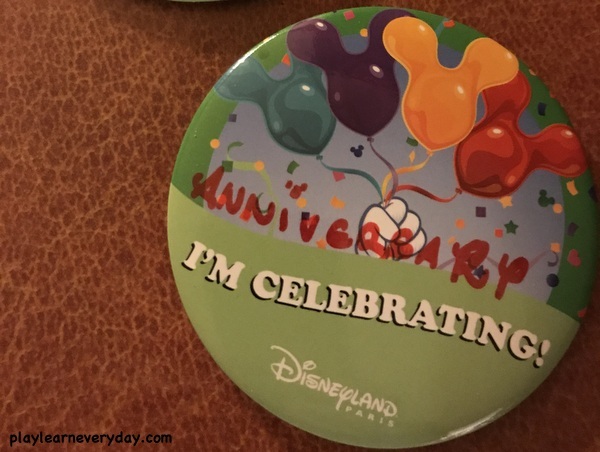 On our way out we quickly popped into City Hall, they don't have the first visit badges that they have in the American parks, but they do have birthday and celebration badges. 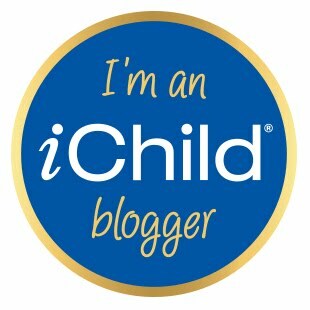 So as it was our anniversary we picked up a couple of badges to celebrate that. 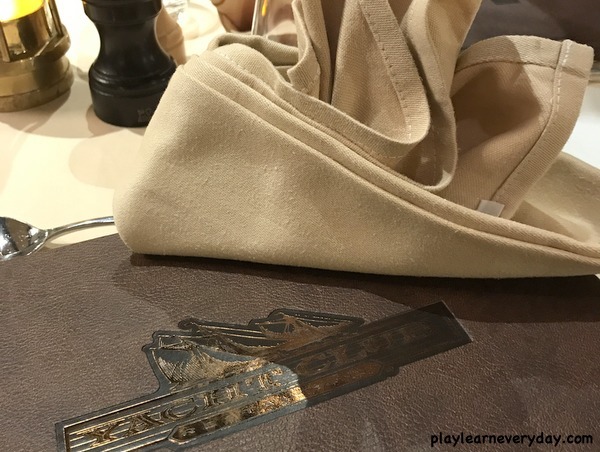 We then went back to the hotel to get ready for dinner at Yacht Club restaurant (which is in the Newport Bay Club hotel). We had the Half Board Plus meal plan, so this dinner was an option on the plan. There is a specific three course menu and you only get a couple of choices for each course. If I'm honest, we didn't love the food or the atmosphere of this restaurant. 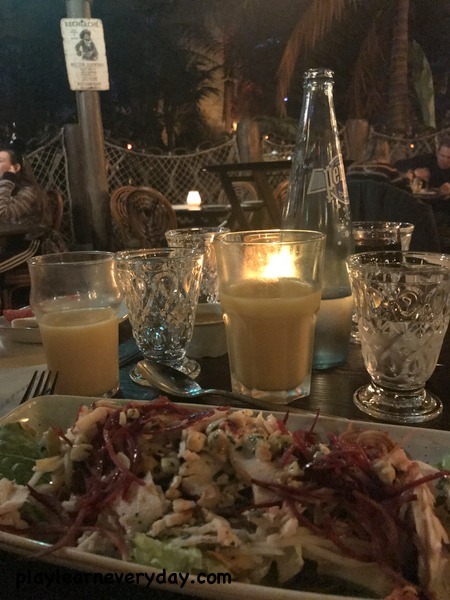 It was quite empty and quiet, the food was not very well cooked and they absolutely rushed us from one course to the next (actually bringing our mains to the table whilst we were still eating our starters). So this isn't a restaurant that I would recommend going to as it wasn't our favourite. So we went downstairs for the hotel buffet breakfast, which again was included in our Half Board Plus meal plan. The buffet had cereals, pastries and some hot food options. We mostly stuck to the cereal and pastries as the hot food was not very nice. The coffee comes from push button machine, which was also disappointing. The breakfast was fine as it was enough to get us started for the day, but we wouldn't recommend paying for it if you aren't on the meal plan. However, because we were running late we managed to meet Pluto in the hotel! 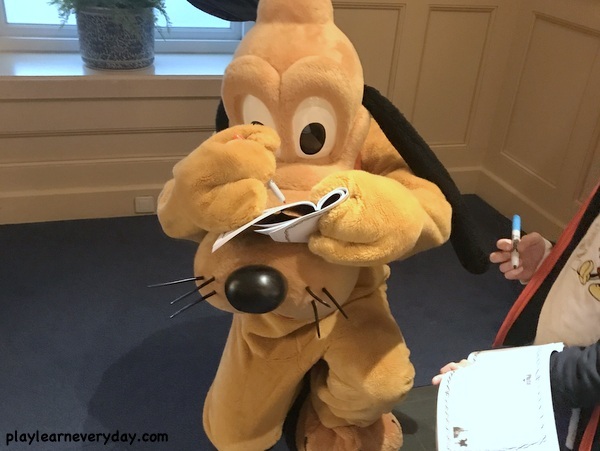 Another perk of staying in one of the Disneyland hotels is that a character comes to visit in the hotel lobby each morning. 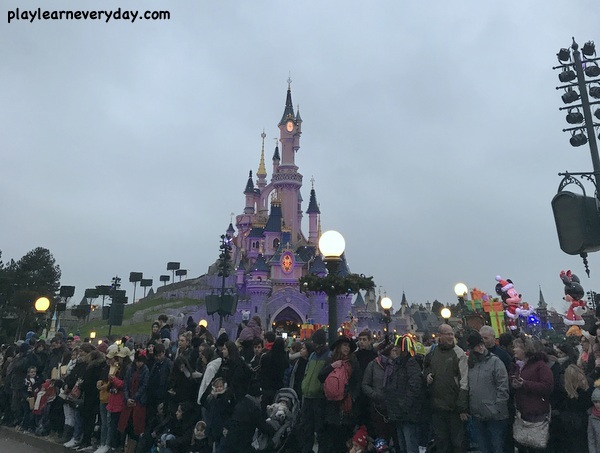 The character is there from 8:15-11am and you still have to queue to meet them, but the queues are much shorter than in the parks. 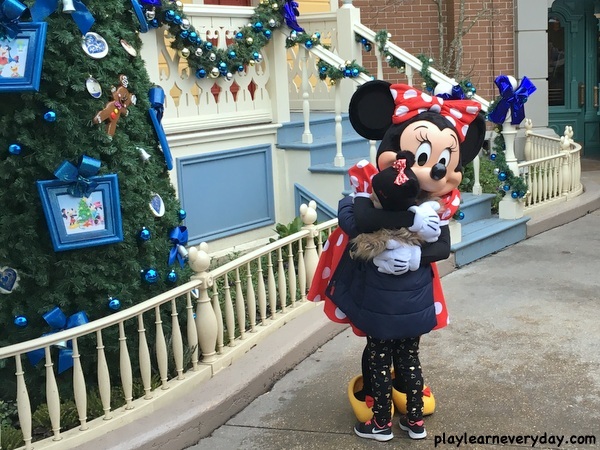 Then we walked over to Disneyland Park and we were surprised to see Minnie Mouse doing a meet and greet just at the end of Main Street USA (in the spot where Marie normally is) so we quickly joined the queue to meet her. Our first ride was Dumbo the Flying Elephant! 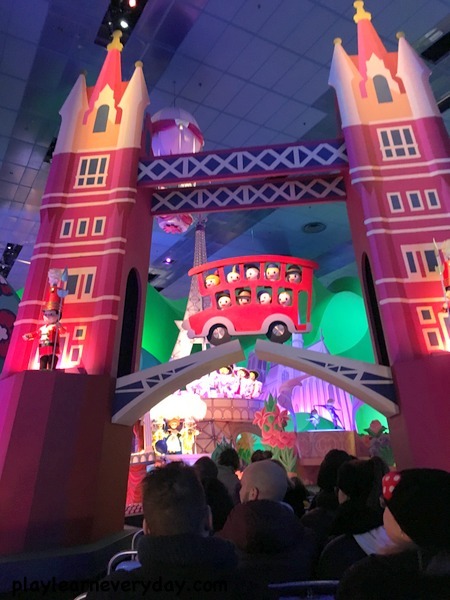 It's a classic, but the children love these type of rides where they have a little control to make the elephant go up and down, so it's a must do as well. 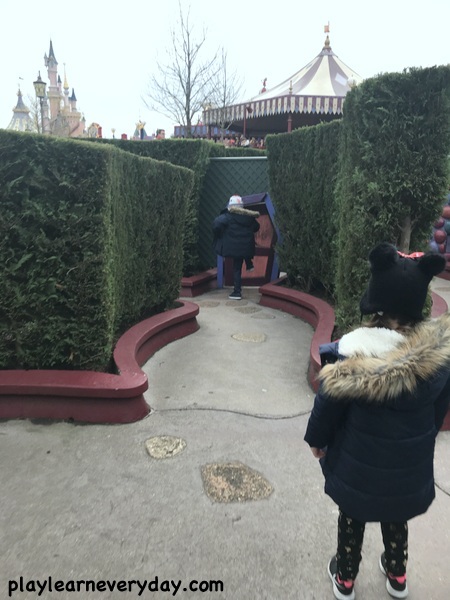 Then we walked over to Alice's Curious Labyrinth. One thing that I love about Disney is that amongst the rides and meet and greets which you may spend a long time queuing for, there are also these walk through areas which you can usually walk straight into. The kids happily ran around the labyrinth finding the different characters along the way. We also went up some stairs to an area above the labyrinth which gave us a lovely view of Disneyland Park. Whilst we were meeting Minnie Mouse earlier my husband had walked over to Peter Pan's Flight with all of our Magic Passes to pick up some Fastpasses for us. I absolutely love this system and think that all parks should have it. Instead of only having a Fastpass system to buy, Disney offers everyone one free Fastpass at a time. So we were carrying these passes with a specific time on them to come back to Peter Pan's Flight whilst we were going on a few other rides with shorter queues. Then we walked straight over, showed our Fastpasses and joined a very short queue which got us straight on the ride. Next we went onto the It's a Small World ride. It's so cheesy but I love it so much! You go on a little boat which takes you through all the different continents with little people singing and dancing. It's adorable! 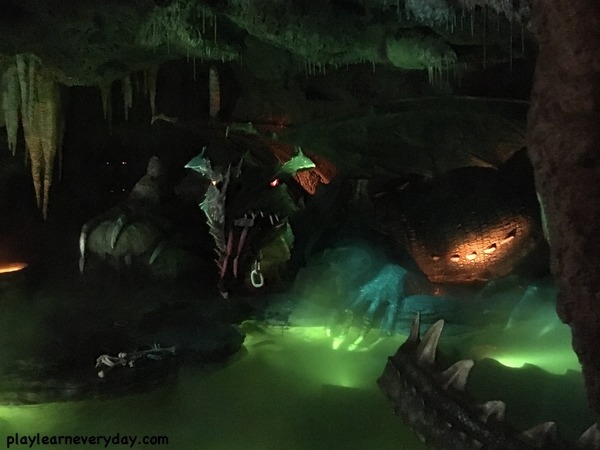 Next we walked over to the back of Fantasyland in area with just a couple of small rides which are often less busy. We went on Le Pays des Contes de Fées which is also a little boat ride which takes you past miniature scenes from fairytales. 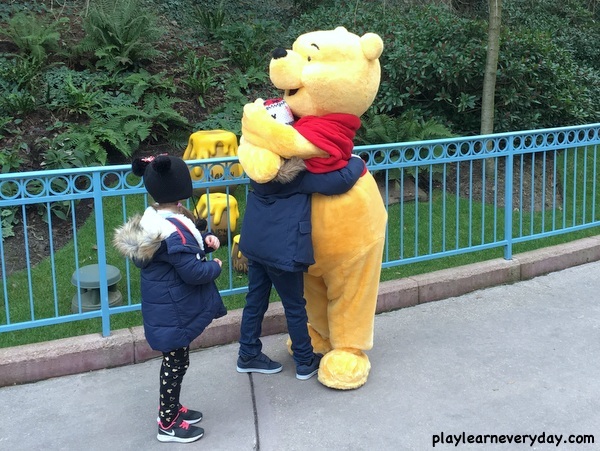 It was then perfect timing to join the queue to meet Winnie the Pooh! These queues can take some time and the children can get really restless, so we were thankful for the snack bags that we had prepared for each day and pulled them out every time! 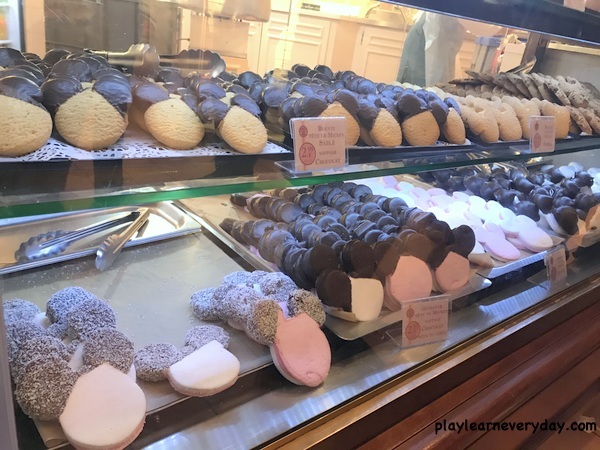 We then wandered back to Main Street USA for a proper snack, and hunted down the Mickey Mouse shaped cookies, marshmallows and meringues! There weren't any in the Cookie Shop as I had hoped, so we were lucky to find these in the sweet shop (Delicious Sweets). 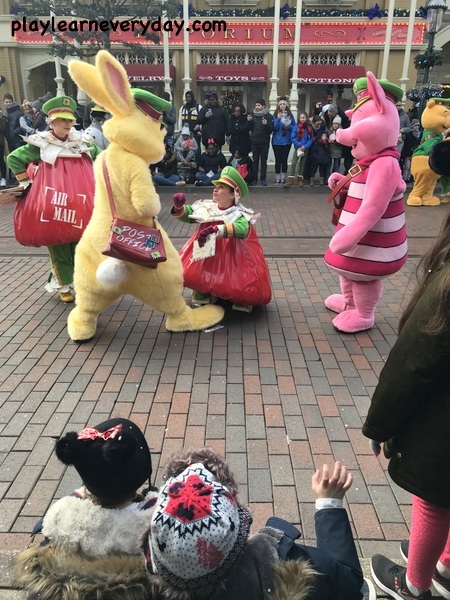 We took our treats and walked out of the shop and realised that everyone was lined up ready to watch the Christmas Parade, so we were lucky to find a perfect spot yet again, and the children could sit down with their snacks and watch the characters go by! 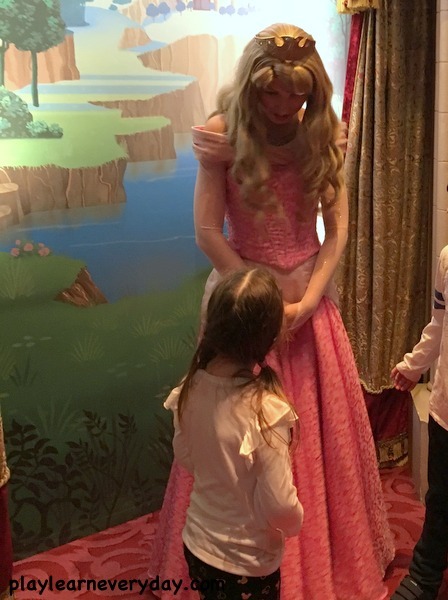 Next we went to the Princess Pavillion, even though we knew that there was a 90 minute wait, we also knew that Ivy's number one priority was to meet a Princess, so we joined the queue to meet Princess Aurora. It actually ended up being almost 2 hours before we got to the front of the queue, but at least you're indoors, so it was a chance to warm up a bit. 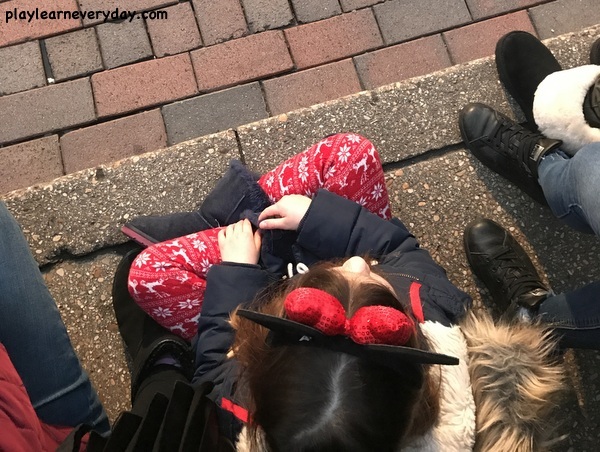 Ivy was mesmerised by Princess Aurora and it was the highlight of the trip for her, so definitely worth the wait! We then went to dinner at Captain Jack's restaurant, which is actually inside the Pirates of the Caribbean ride. 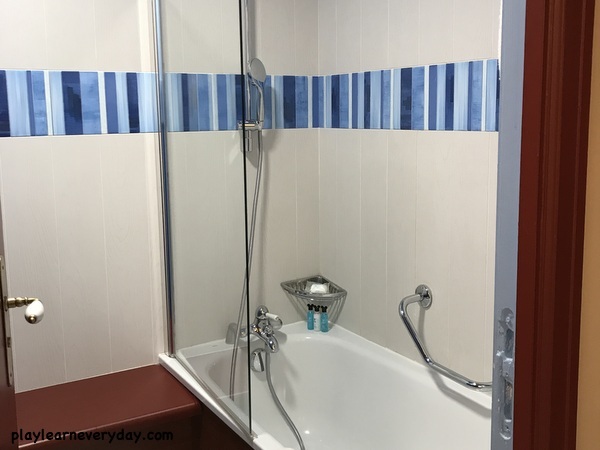 We had booked this in advance (you can make reservations for restaurants up the 60 days in advance, which really is advisable, especially for popular ones like this). I mostly chose this restaurant for the location and the themed interior, and it didn't disappoint. It is very cool to have dinner with a water ride passing by every few minutes and all of the decor is fabulous. Again this was part of our meal plan so we didn't have many choices, but I found the food to be nicer than the Yacht Club restaurant from the previous night). After dinner we took a walk around, it's really lovely to walk through some of the areas at night when they're all lit up. The Swiss Family Robinson house (La Cabane des Robinson) looked spectacular with all of the lights and wasn't busy at all, so we took a walk up there and had a magnificent view of the park all lit up and the castle twinkling. We also walked through Le Passage Enchanté d'Aladdin and Adventure Isle which were also not busy at all. 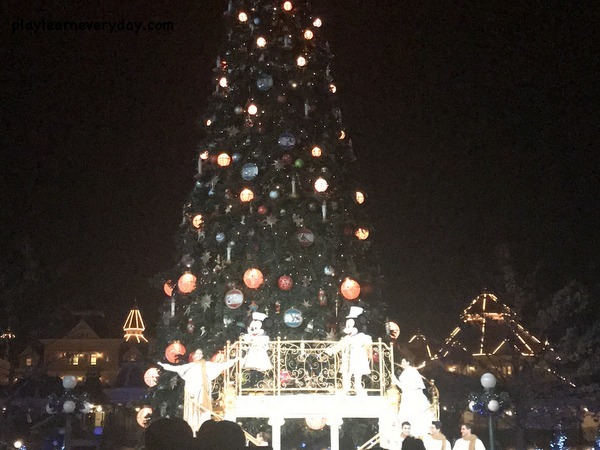 It was then time Mickey's Magical Christmas lights, so we walked over to Main Street USA and watched as Mickey, Minnie and Santa lit up the big Christmas tree and sang a few songs. There was a bit more of that magical Disney snow that I love and it was the perfect end to our day in Disneyland Park. Again we didn't quite get the early start that we hoped for, but it meant another relaxed hotel breakfast buffet and the chance to meet Mickey Mouse in our hotel before heading out to the parks. 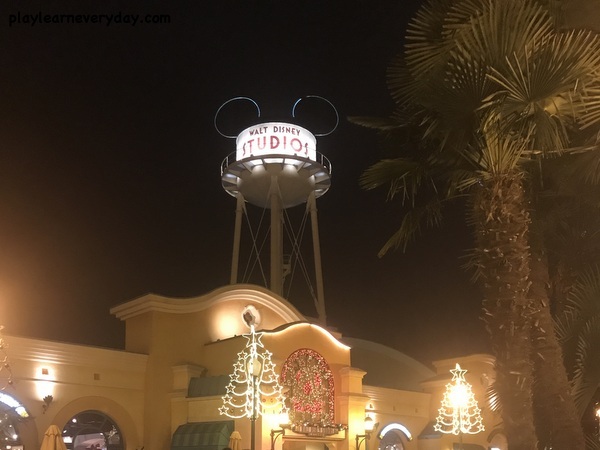 This time we had figured out that there really isn't anywhere to get a decent coffee in the hotel or the parks, so we picked up a Starbucks in Disney Village! 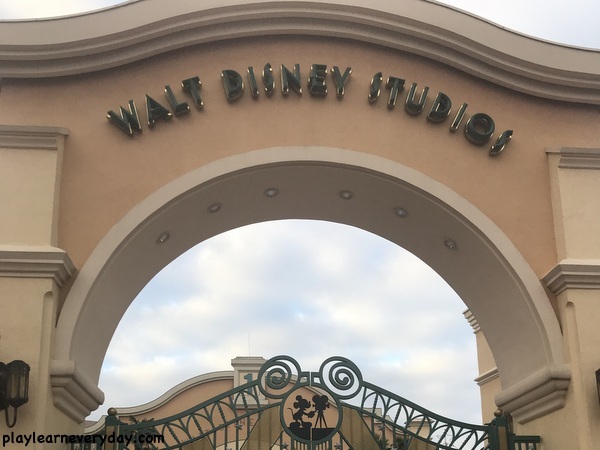 We then walked over to Walt Disney Studios Park to explore. As we got in it was just about time to get onto the Lineberty app to book times to meet the characters (15 minutes before their meeting time begins). 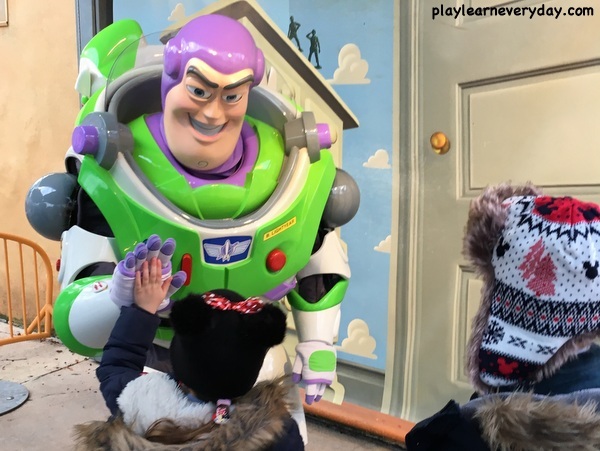 This is only in the Studios Park, but it is essential if you want to meet those characters as you can not just walk up to them and join the queue (we saw many disappointed people who didn't know the system, which was a shame) and you also need to do it as soon as booking opens as the slots go quickly. 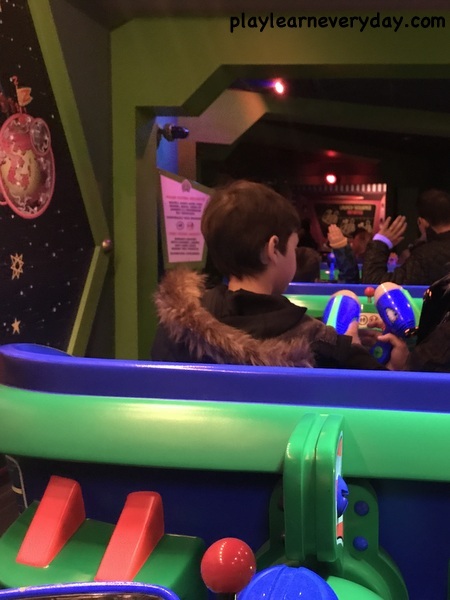 We both had the app on our phones with set characters to book for (you can only book one at a time) so we got time slots to meet Buzz Lightyear and Spiderman. We really must have been quick on it as we were 4th in the queue to meet Buzz Lightyear, so we went over there straight away. It is cool to be there when he arrives as they play some music and he struts out over to his spot. We hardly waited any time at all before it was our turn to meet him. 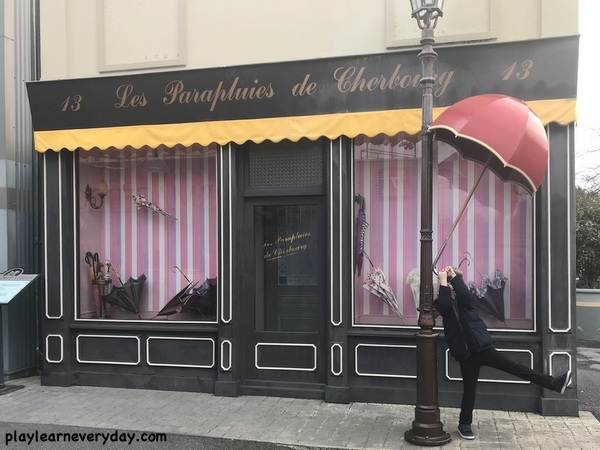 Walt Disney Studios Park is also great for photo opps, we love this umbrella in front of Les Parapluies de Cherbourg, the Lightening McQueen display, and the Toy Story Playland area is full of cool things! 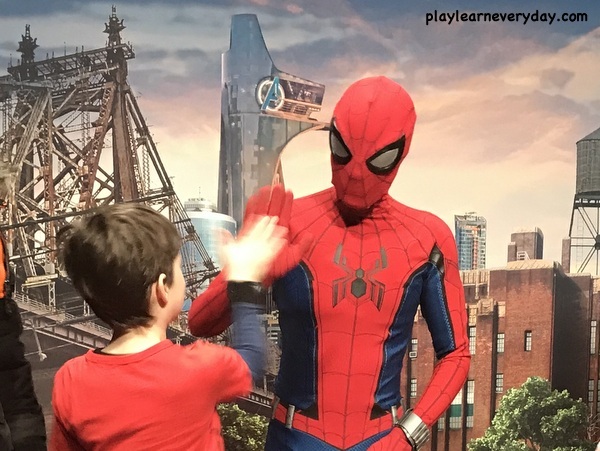 Then it was already our time slot to meet Spiderman, so we headed over there and did have to wait a bit longer this time. But I'm not surprised as he does make it a bit of an experience, having long chats with the children and posing for plenty of different photos. 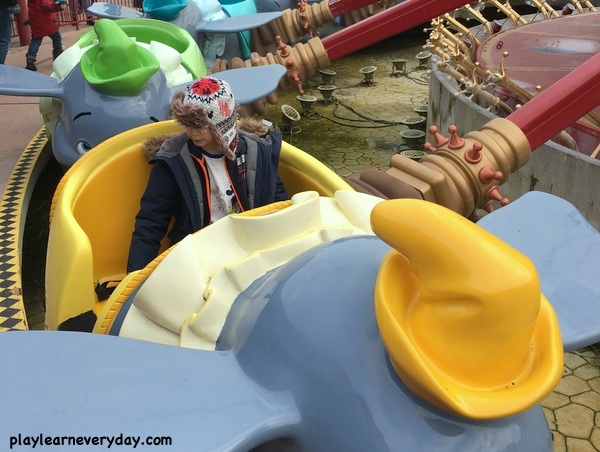 We then went on the Cars Quatre roues Rallye ride, the Flying Carpets Over Agrabah Ride, the Ratatouille: L'Aventure Totalement Toquée de Remy ride (which we had a Fastpass for) and the Slinky Dog Zigzag Spin ride. 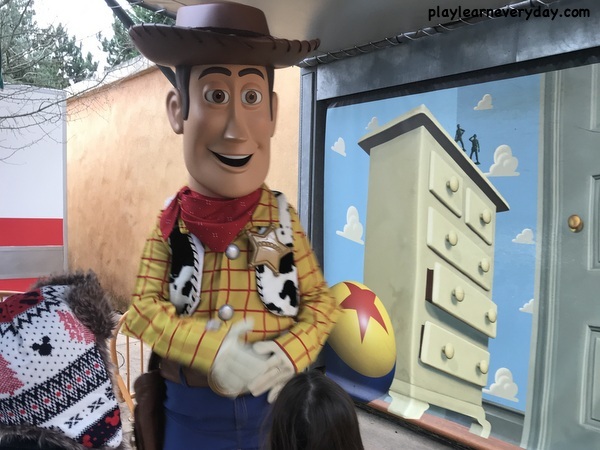 Whilst we were queing for that last one the afternoon character meet and greet slots became open, so we managed to book in to meet Woody and again were one of the first ones in the queue so we walked straight over. 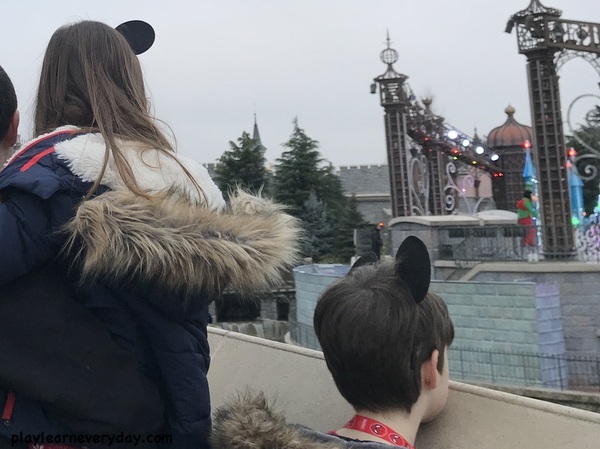 We then went to buy some yummy Mickey Mouse shaped waffles from a little van in the Toon Plaza area and watched a bit of the Surprise Mickey show in the Production Courtyard. 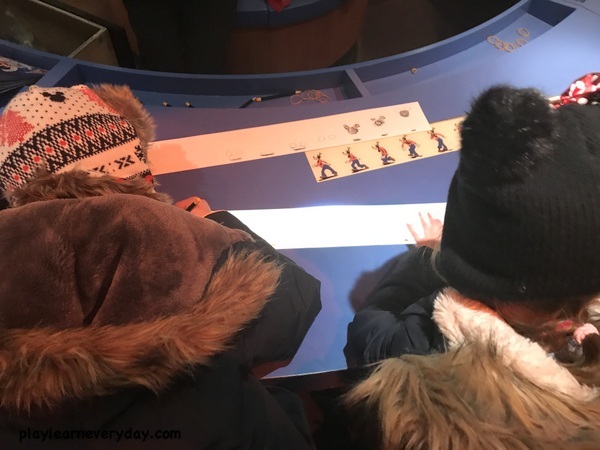 We then went over to the Art of Animation Studio where the children had a go at drawing their own little animations. 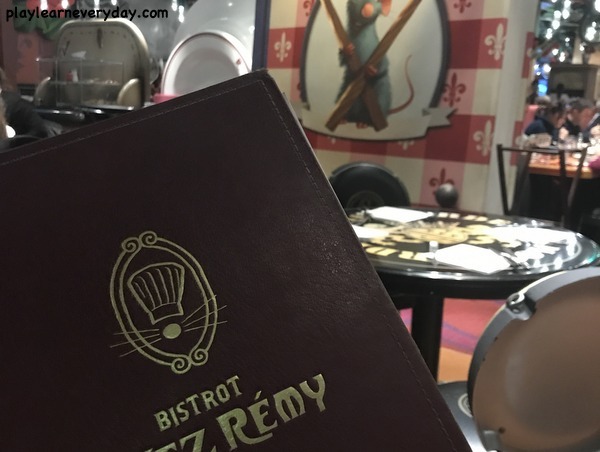 Then it was time for our dinner reservation at Bistrot Chez Remy. This restaurant is also in a ride, but it is mostly fantastic for it's theme. It is as if you are a tiny rat in a full sized restaurant, so all of the decor is huge. The children absolutely loved it, so we highly recommend it (it was also the nicest food of our three dinners at Disneyland). There is so much to see in this restaurant that we were walking around and taking photos between courses, it was great! 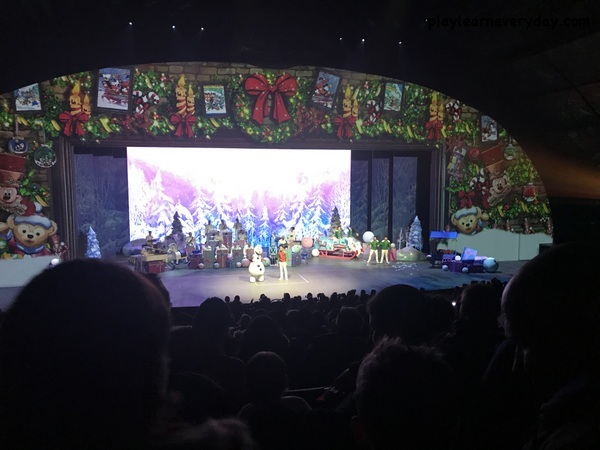 We then walked around a little bit before watching the nighttime show at Walt Disney Studios, Goofy's Incredible Christmas. These shows are on at the time the park closes, which for us was 8pm (the Illuminations show in the main park was at 10pm, so we actually didn't manage to stay out late enough for that one unfortunately, so we were glad of an earlier option). We finally got up early enough to make it into the park for early magic hour! 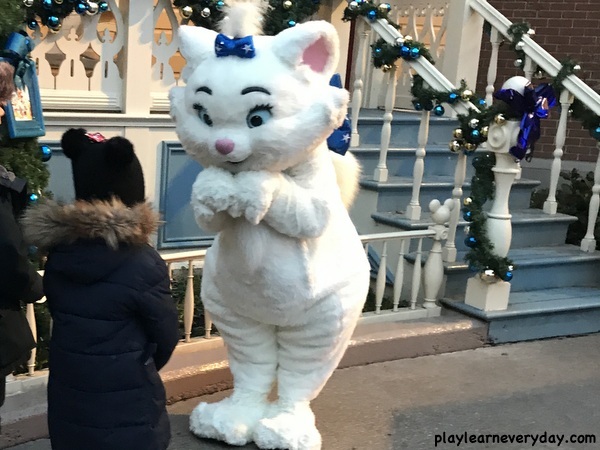 And we were not disappointed as we walked through the gates and went straight to meet Marie from the Aristocats with hardly any queue at all. We were also able to take lots of castle and main street USA photos with hardly any other people around. 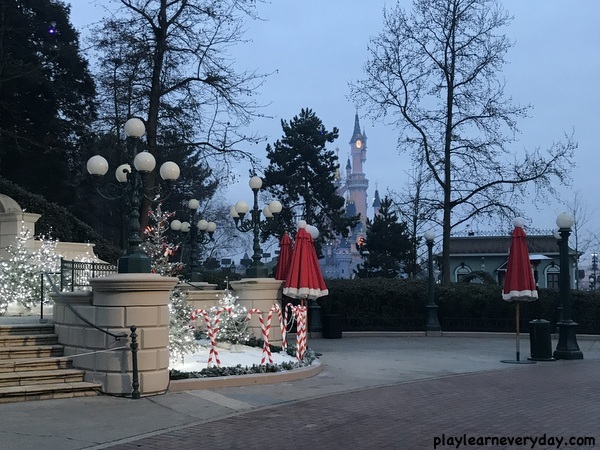 We then headed over to Plaza Gardens for the special character breakfast which we had made reservations for at the time of booking our holiday. My only advise here would be to arrive at the restaurant as early as you can, as there isn't really a queueing system (just lots of pushing and shoving to get in when they open the doors!) and you want to get settled into your table and get some food before the characters start coming around. 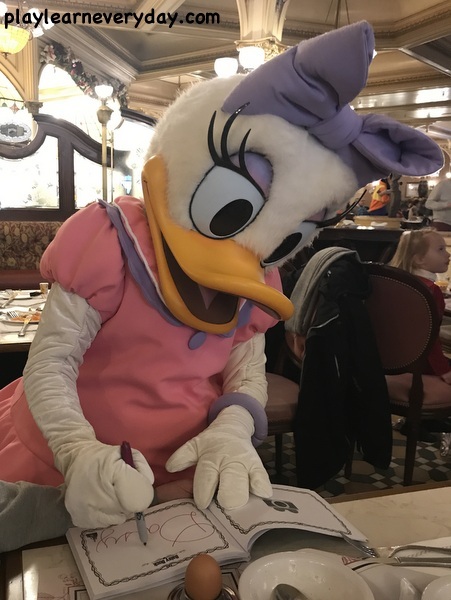 We got to meet Scrooge McDuck, Daisy Duck, Mickey Mouse, Goofy, Eeyore and Tigger and have photos with all of them and autographs as well. It was the perfect end to our trip. We then headed back to the hotel to check out and load up the car, we went into the gift shops to buy a little something for the children (we saved this until the end so that whenever they saw something they could think about if it was the thing that they wanted), I also bought a PhotoPass+ at this point. It's great to buy at the beginning, but I did read some advise that said that if you save all of your photo cards you can then see if you accumulate enough photos to warrant spending the money on the pass. As we had met loads of characters there were a lot of photos on there, and they were all much better quality and with better lighting so it was worth it for us. 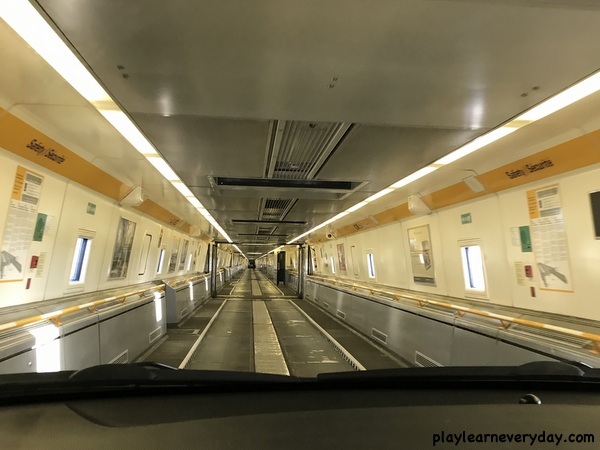 We then drove back home, with more car presents to keep the children busy, a bit of a longer wait at a much busier Eurotunnel and so many photos and memories to keep us going until our next trip! I've just found a load of videos on my phone, so I've put them all together for a little Disney compilation video!